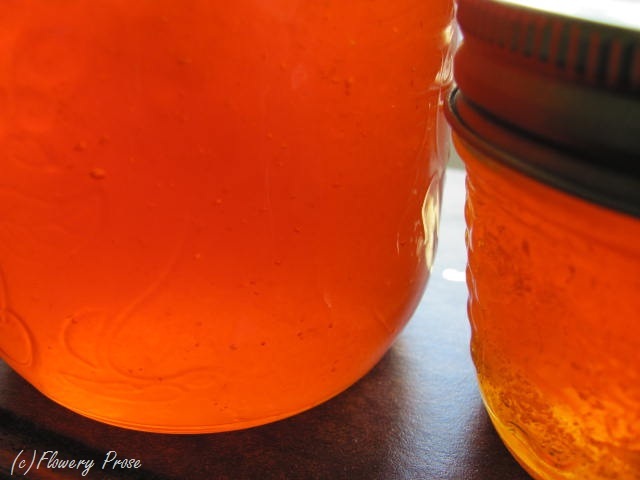 Recipe: Sea buckthorn and apple jelly. It’s time for my annual visitation of this old-but-relevant post from 2012…’tis the season for harvesting sea buckthorn berries in Alberta (and many other places worldwide)! Tasty AND beautiful! My hubby and I managed to get out this past Saturday morning and gather some sea buckthorn fruit so that I could try my hand at making jelly from it. If you’ve been reading my blog for a while, you’ll recall that I made a sea buckthorn beverage last year – I just love the citrusy taste of the berries and their gorgeous sun-bright colour. Sea buckthorn (Hippophae rhamnoides) is a fairly common roadside plant here in Calgary – the City planted many of them years ago, mostly for erosion control on slopes. It’s one of those shrubs you’d be hard-pressed to kill: it’s tough-as-nails, drought-tolerant, pollution and salt-tolerant (good for our winter roads and all that de-icing salt), and a fairly aggressive spreader. You don’t find it employed as an ornamental landscape plant very often, but it’s really very pretty, with silvery-green leaf clusters and the brilliant autumn fruit. (Both male and female plants are required for fruit production). Sure, some people may be turned off by the thorns, but they contribute to the shrub’s rabbit and deer resistance, which can’t be a bad thing, right?! The only thing that irks me to no end about gathering sea buckthorn berries is that it’s just such a difficult process – the fruit only comes off the stems under extreme duress. The kind of duress that leaves you standing there with bright orange seabuckthorn juice all over your clothes and squirted in your eye. I’ve read that commercial harvesters of the shrub just go along and prune off fruit-bearing branches, freeze them for awhile, and then “shake” the berries free…but I didn’t give that a go. I ought to have – it took me FOREVER to get the berries off of the branches. But it’s worth it for this jelly. Trust me. It’s so yummy and pretty! (I added apples to this recipe because I didn’t use commercial pectin – sea buckthorn doesn’t have very much natural pectin, so the addition of a high-pectin fruit helps the jelly set properly. I had some British Columbia-grown ‘Sunrise’ apples, but use any variety you love. Crabapples would work as well). Place berries, apples and water in a saucepan and bring to a boil. Reduce heat to medium-low, and simmer fruit for 20 minutes. Stir periodically and crush the fruit against the side of the pan with the back of the spoon. (It all mashes down pretty well on its own, and won’t require much additional help). Strain the fruit through a jelly bag (or several layers of cheesecloth) over a large bowl. Don’t force the fruit through the bag – this will make the jelly cloudy and you don’t want that! Set it up so that the fruit can slowly strain overnight. In the morning, sterilize your canning jars and lids. Measure out the juice. I ended up with 2 cups using this recipe, but your measurement may vary slightly. Place the juice into a saucepan and mix in an equal amount of white sugar. Bring the sugar and juice to a rolling boil and boil, stirring constantly, until you’ve reached gel point. Carefully pour the jelly into the sterilized jars, apply the lids and rings, and process in a boiling water bath for 10 minutes (don’t forget to adjust the length of time according to altitude, as specified in this handy chart). If you plan to eat the jelly soon and don’t want to go to all the trouble of processing jars for storing, you can just pop the jars into the fridge once the jelly is cool. It is a very small batch, after all…and you’ll be hooked once you have a taste! 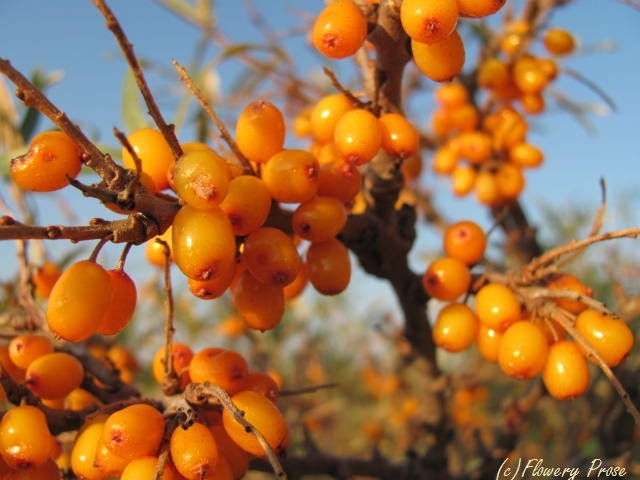 Do you grow sea buckthorn in your garden, or do you forage for sea buckthorn berries? Looking for more sea buckthorn berry recipes? 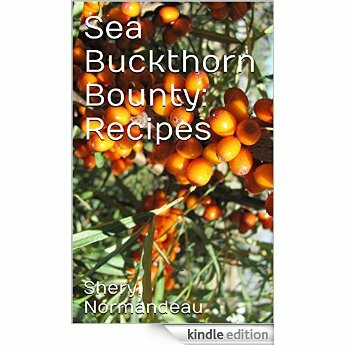 My sea buckthorn berry recipe book, Sea Buckthorn Bounty: Recipes is now available here! This entry was posted in Alberta, Botany, Calgary, Canada, cooking, Food, Fruit, Gardening, Horticulture, Plant and tagged Berry, Canning, Eating sea buckthorn, food preservation, fruit, Sea buckthorn, Sea buckthorn berry, Sea buckthorn berry jelly, Sea buckthorn berry recipes, Sea buckthorn jelly. Bookmark the permalink. ← Fun with search terms, Flowery Prose edition. Interesting. I have never heard of Sea Buckthorn. 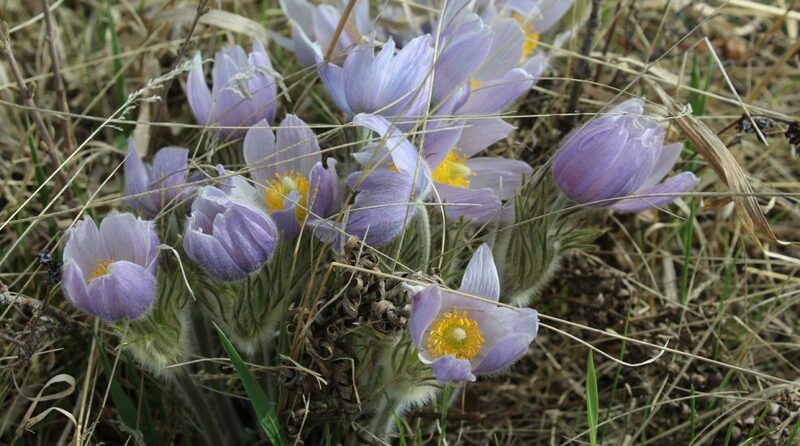 I hadn’t seen them until I moved to southern Alberta years ago and worked in a garden centre – we brought a few of the shrubs in for sale and then I started noticing that the city had planted them all over near parks, roadways, and overpasses. They’re not as common in North America as they are in Europe and Asia, that’s for sure. J > Looks don’t always translate into Likes! Raw Sea Buckthorn, raw, is a taste we all of us need to try once in life! And once only! But as a natural modifier – adding pectin, colour, trace minerals and vitamins, and giving a buzz of natural goodness, there’s not much else like it : limes and lemons don’t come close ; the nearest might be Rowan (Mountain Ash) berries. Yes, they are certainly tart if eaten fresh and not to everyone’s liking, that’s for sure – mixing them with other ingredients is preferable! But they’re very versatile, and can be used in juice and baking and even savoury dishes. We have plenty of mountain ash trees here and I intend to make jelly with the berries at some point; apparently, it is necessary to freeze the berries before preparation so if I wait just a few more weeks, they’ll do so naturally and I can try it out. I believe you’re right – something about the freezing bringing out a better flavour or sweetness or something of that sort. We sometimes leave the carrots in for the first frost for that reason (I’ve never grown parsnips or I expect I’d do the same thing). LOL, your understanding of the geography of Canada is sound – not to worry! 😉 Alberta is still as land-locked as is possible, hemmed in by the Rockies in the west. While sea buckthorn is usually considered a coastal plant, it is hugely adaptable and grows mightily well here in the foothills and all over the Prairies (and it can easily handle our insane winters). Since I wrote the original post in 2012, I’ve seen more and more sea buckthorn plants pop up in both urban plantings and home gardens – it’s becoming quite popular here! Lots of new cultivars available now as well, including some that are easier to harvest. Now, I’m not sure why sea buckthorn won’t grow near you, by the sea. Hmmmmm…. This sounds lovely! I live near the sea and there are a few Sea Buckthorn bushes on the coast but they are not common and I haven’t seen much fruit on them. The birds must get there first! Oh yes, the birds do seem to love them!